Sales of analog ICs are expected to show the strongest growth rate among major integrated circuit market categories during the next five years, according to IC Insights’ new 2018 McClean Report, which becomes available this month. The McClean Report forecasts that revenues for analog products—including both general purpose and application-specific devices—will increase by a compound annual growth rate (CAGR) of 6.6% to $74.8 billion in 2022 from $54.5 billion in 2017. The 2018 McClean Report separates the total IC market into four major product categories: analog, logic, memory, and microcomponents. 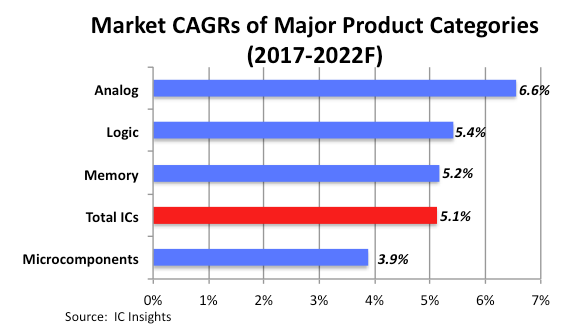 Figure 1 shows the forecasted 2017-2022 CAGRs of these product categories compared to the projected total IC market annual growth rate of 5.1% during the five-year period. Analog ICs, the fastest growing major product category in the forecast, are a necessity within both very advanced systems and low-budget applications. Components like power management analog devices help regulate power usage to keep devices running cooler and ultimately to help extend battery life in cellphones and other mobile/battery operated systems. The power management market is forecast to grow 8% in 2018 after increasing 12% in 2017. In 2018, the automotive—application-specific analog market is forecast to increase 15% to be the fastest growing analog IC category, and the third-fastest growing of 33 IC product categories classified by WSTS. The growth of autonomous and electric vehicles and more electronic systems on board all new cars are expected to keep demand robust for automotive analog devices. Communications and consumer applications continue to represent the biggest end-use applications for signal conversion analog ICs. Signal conversion components (data converters, mixed-signal devices, etc.) are forecast to continue on fast-track growth with double-digit sales gains expected in three of the next five years. After an extraordinary 58% sales spike in 2017, the memory market is forecast to return to more “normal” growth through the forecast. The memory market is forecast to increase by a CAGR of 5.2% through 2022. New capacity for flash memory and, to a lesser extent for DRAM, should bring some relief from fast-rising ASPs and result in better supply-demand balance for these devices to support newer applications such as enterprise solid-state drives (SSDs), augmented and virtual reality, graphics, artificial intelligence, and other complex, real-time workload functions. Meanwhile, growth in the microcomponent market (forecast CAGR of 3.9%) has cooled significantly due to weak shipments of standard PCs (desktops and notebooks). Tablet sales have also slowed and weighed down total microcomponent sales. With the exception of the 32-bit MCU market, annual sales gains in most microcomponent segments are forecast to remain in the low- to mid single digit range through 2022. IC Insights forecasts the total IC market will increase by a CAGR of 5.1% from 2017-2022. Following the 22% increase in 2017, the total IC market is forecast to grow 8% in 2018 to $393.9 billion and then continue on an upward trend to reach $466.8 billion in 2022, the final year of the forecast.